Can a summer of great books push students to college? Reading, writing and arguing: Can a summer of big questions push students to college? 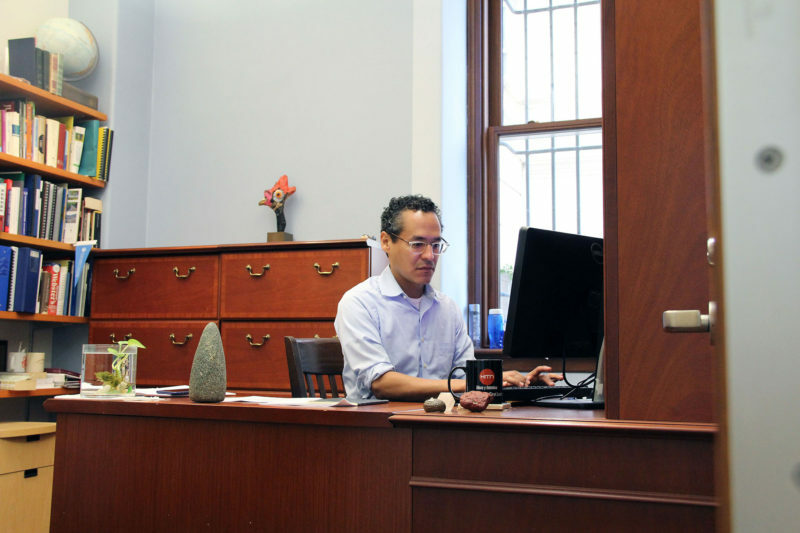 NEW YORK — On a recent Monday, American Studies professor Roosevelt Montás had the usual list of questions for high school students studying on Columbia University’s campus: How was your weekend? Did you catch up on sleep? The 15 students gathered around a classroom table — along with 30 others studying nearby — were participants in Columbia’s 10-year-old Freedom and Citizenship program. It’s aimed at introducing promising minority, immigrant and low-income New York City teens to an intense, high-brow college life that few in their families or neighborhoods have experienced. Unlike programs at other colleges and universities, the curriculum focuses on major Western philosophical thinkers and writers via a “great books” program that Montás, who directs Columbia’s Center for the Core Curriculum, considers critical to students’ intellectual development. Montás believes core studies create a more equal playing field for underrepresented students by exposing them to big questions about human experience that they might not encounter otherwise. Exposure to core studies may also increase the likelihood that these students will graduate from college: College completion is a key problem for disadvantaged black and Hispanic students, who are less likely than whites to earn bachelor’s degrees. Almost all Freedom and Citizenship participants — some 98 percent — finish college within five years of entering, said Jessica Lee, the program’s associate director. Nearly half — 46 percent — major in the humanities or social sciences, Lee said. That’s why Montás was thrilled when the university asked him to shape the curriculum into a free four-week residential program for New York City students entering their final year of high school. He identifies with many of the 45 teens from Harlem, Washington Heights, Queens and other parts of the city, who are chosen for the highly competitive program based on their intellectual curiosity and potential to benefit from the curriculum. The free program was funded initially by a grant from the Teagle Foundation. “Hobbes is the first thinker who tries to imagine a society, a political organization, assuming equality rather than inequality,” Montás said, looking at the class for their thoughts. Kirsten Daye, 16, raised her hand. “I feel like he’s talking about men only, though,” noted Daye, of Harlem, a student at Manhattan’s Maxine Greene High School for Imaginative Inquiry. “Men,” Daye retorted, noting Hobbes had mentioned violence and wife-stealing in the book. Some 98 percent of students who participate in Columbia University’s Freedom and Citizenship summer program finish college within five years of entering. While dozens of colleges and universities use a “great books” curriculum, only a handful make it available to local high school students. Yale University’s Citizens, Thinkers, Writers program invites a dozen public school students to campus for two weeks in July, while Wisconsin’s Carthage College offers the Humanities Citizenship Initiative. Both are modeled closely on Columbia’s program. Columbia and Yale’s programs are residential — students stay in campus dorms during the week and return home on weekends — but Carthage hasn’t been able to do that. A dorm stay is out of the question for too many of its 18 participants, who must also earn money for their families and take care of siblings, said Ben DeSmidt, a Carthage classics professor who runs the summer program together with history professor Eric Pullin. Carthage, like Columbia, aims to help students who are newly focused on academics, those who are low-income and the first in their families to attend college. The program relies on local high school guidance counselors to find participants, DeSmidt said. While Columbia’s goal is to get all participants to college, Carthage just wants its students to show an interest in higher learning. About 90 percent have gone on to college, vocational education or the armed forces, DeSmidt said, and nearly all show an aptitude for learning. Programs that encourage reading, thinking and discussion of ideas can be much more effective at pushing students toward college than traditional summer school, said Mandy Savitz-Romer, a former urban school counselor who is now a senior lecturer in the Harvard Graduate School of Education. All three summer programs revolve around big questions to instill a sense of community in their students: Does equality exist? How are the masses best governed? At Yale, organizers use the people and programs of New Haven, Connecticut, to extend the classroom. This summer’s students met with the city police chief and president of the local school board; they also had dinner with a New Haven alderwoman. Carthage students visited the local Civil War museum to connect theory with history, while Columbia asks participants to spend their senior year of high school working on a civic leadership project. Daye and classmate Iaisha Johnson, 16, used a break during the two-and-a-half-hour class to continue discussing Hobbes. Some students wish they had even more time in class. “A lot of people are, like, ‘I wish it was shorter so we had more free time,’ ” said Jessie Henriquez, a 17-year-old from Washington Heights in Manhattan. “I’m like, no, I need these two and a half hours,” she added, noting students must read and annotate 15-20 pages a day and write a daily response paper. Although the students are largely enthusiastic, instructors in all three programs have found one major obstacle to student success: writing. They say writing skills among all students — even the undergraduates at their selective colleges — are abysmal. Yale’s program spends extra time helping summer students with writing, said Kathryn Slanski, a Yale lecturer in humanities and Near Eastern languages, who helps run the program with Bryan Garsten, a political science and humanities professor. Students from underfunded public schools tend to have particular problems, she said. Summer students at Columbia say they wouldn’t trade the Freedom and Citizenship program for a more traditional writing workshop. The program has been an eye-opener, both for students who are native New Yorkers and those who, like Montás, arrived as immigrants. This story about higher education was produced by The Hechinger Report, a nonprofit, independent news organization focused on inequality and innovation in education. Read more about higher education.